We have used the University of Tasmania's 30-m radio telescope at Ceduna in South Australia to regularly monitor the flux density of a number of southern blazars. We report the detection of an annual cycle in the variability time-scale of the centimetre radio emission of PKSB1622−253. 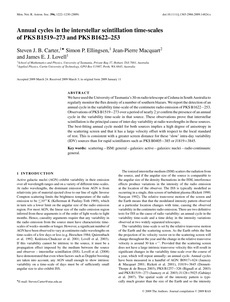 Observations of PKS B1519−273 over a period of nearly 2 yr confirm the presence of an annual cycle in the variability time-scale in that source. These observations prove that interstellar scintillation is the principal cause of inter-day variability at radio wavelengths in these sources. The best-fitting annual cycle model for both sources implies a high degree of anisotropy in the scattering screen and that it has a large velocity offset with respect to the local standard of rest. This is consistent with a greater screen distance for these 'slow' intra-day variability (IDV) sources than for rapid scintillators such as PKS B0405−385 or J1819+3845.